This morning just after 11:00hrs Engine 22 was dispatched to the reported MVA at the intersection of Cash Rd. and Greenland Dr. in front of Houston Community College. Upon arrival of Battalion 21 a 2-vehicle MVA was reported with 1-subject trapped and the assignment upgraded bringing Truck 21. 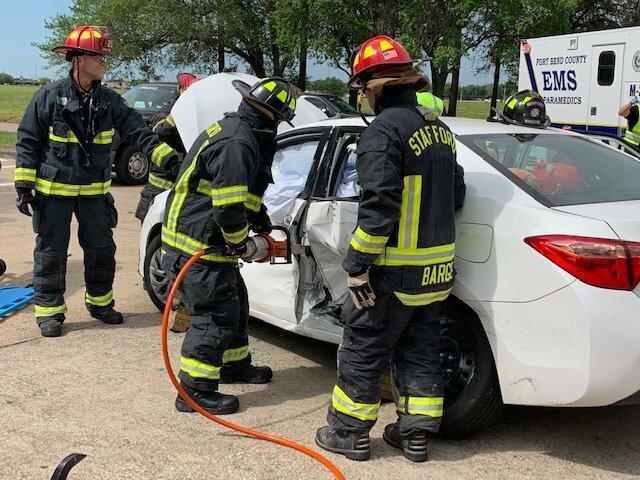 Following vehicle stabilization one door was taken with the Holmatro tools and the patient extricated and turned over to FBCEMS Medic #3. Upon taking up all units returned to service.